No. 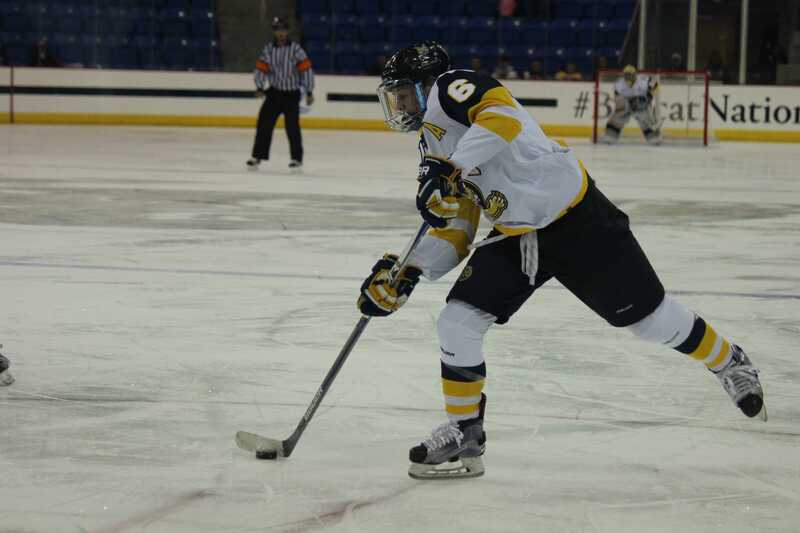 3/3 Quinnipiac women’s ice hockey fell to No. 6/7 Boston College by a score of 4-1 on Saturday at High Point Solutions Arena in Hamden. The game was the second of a home-and-home series between the two top-10 programs. On Friday, the Bobcats and Eagles played to a scoreless tie. It took 85 minutes and 34 seconds of hockey for either team to record a goal this weekend. The first period was scoreless, despite a big miss on the doorstep by Boston College’s Kristyn Capizzano, who had Sydney Rossman sprawling with less than five minutes. Quinnipiac led in shots on target 6-5 in the first. The Eagles defense blocked six shots to the Bobcats’ one, while the Eagles fired four shots off target to the Bobcats’ one. The organized, defensive structure of the first period gave way to back-and-forth hockey in the second, as both teams traded a flurry of dangerous scoring chances. Boston College struck first with 14:26 remaining in the second period when Toni Ann Milano found the back of the net just six seconds into a power play opportunity. Makenna Newkirk and Andie Anastos each picked up assists on the play. The Bobcats struck back with a power-play goal of their own as Taryn Baumgardt gathered a puck at the point and fired a shot through traffic that was deflected past Boston College goaltender Katie Burt with 13:06 remaining in the period. Baumgardt was credited with the goal, while Kati Tabin and Emma Woods registered assists on the play. Newkirk regained the lead for the Eagles when she cut to the front of the net from the corner, beating Rossman five-hole with 15:46 remaining. Although the Eagles registered 14 penalty minutes to the Bobcats’ eight, head coach Cassandra Turner felt that taking two penalties in the second period was detrimental to the team. Boston College led 13-11 in shots going into the third period. With 12:22 to play and a chance to tie the game, Meghan Turner rang a shot off the post. Shortly after, when Andie Anastos was called for a trip with 11:16 remaining to put Quinnipiac on the power play, the Bobcats seemed to be building some momentum. That changed when Caitrin Lonergan scored a shorthanded goal for the Eagles with 10:37 left in the game. Lonergan was left wide open in front of the net for a backhand pass from Newkirk, who was battling two Quinnipiac defensemen. Lonergan had plenty of time to beat Rossman on a forehand-backhand move to put the Eagles up 3-1. From that point forward, the Eagles took charge, building their lead to 4-1 with another goal at the 8:46 mark. The goal came when Kenzie Kent tapped home a pass from Andie Anastos, who curled out from behind the Bobcats’ net. Like Lonergan, Kent was also left all alone in the slot. Turner attributed the Bobcats’ leaving so many players uncovered in the third period to a lack of discipline in their own zone. At the end of the game, Boston College had outshot Quinnipiac 19-18. Senior center and captain Emma Woods felt as though the Bobcats should have focused more on the little things. “We can’t be like, ‘Okay let’s go out there and score,’ it’s ‘we’re going to go out there and win each battle, whether it’s in our zone, the neutral zone, or their zone.’ From there, we can build confidence off of those,” Woods said. With the loss, Quinnipiac drops to 5-2-1 overall. The Bobcats will travel to New Haven where they will take on Yale (2-0) to start ECAC conference play at 6 p.m. on Friday.